The 20th Season began on February 22nd at the Japan Information and Culture Center in Washington, DC. The program was called “Sho and Percussion” and featured Mayumi Miyata on sho and Midori Takada on percussion. They performed both traditional and contemporary repertoire including pieces by Midori Takada, John Cage, Toshi Ichiyanagi, Masahiko Satoh, and Toshio Hosokawa. In New York, from February 24-26, Music From Japan celebrated its 20th Anniversary with three days of music, a lecture, and a symposium. On the first day, Music From Japan presented the work of Toshi Ichiyanagi. The pieces included works written in the previous 7 years, including one world premiere of a Music From Japan commission, called Music for Violin, Sho and Piano. On the second day, “Highlights of Music From Japan Commissions” presented five selections of the twenty commissions Music From Japan had presented in previous years. The pieces were written by Toshi Ichiyanagi, Akemi Naito, Akira Miyoshi, Somei Satoh, Shigeaki Saegusa, and Yuji Takahashi. They were performed by a cast of world class musicians including Fred Sherry, Paul Zukofsky, Martin Goldray, the Cassatt String Quartet, and Mayumi Miyata. The third day was a repeat of the program presented on February 22nd in Washington DC. The Festival was concluded with a symposium moderated by John Rockwell and paneled by several of the performing musicians called “Looking Toward the Next Millennium.” After the New York festival was over, the “Sho and Percussion” program traveled to the Royal Ontario Museum in Toronto, Canada, to perform on February 28th. On March 8th Music From Japan presented a special concert to commemorate the 50th anniversary of the United Nations in Dag Hammerskjold Library Auditorium at the UN. The program was another edition of the “Masters of Tradition” series, this time featuring Meisho Tosha on yokobue, Seizan Sakata on shakuhachi, Junko Handa on voice and biwa, Hidetaro Honjoh on voice and shamisen, and Reiko Kimura on koto. The program featured a piece for all of the performers by Katsutoshi Nagasawa called Ode to the Fountain of Togyoku. The work was commissioned by Music From Japan and paid homage to the peace-keeping efforts of the UN. Throughout the rest of March, the “Masters of Tradition” program went on an extensive tour to Sao Paulo, Curitiba, Porto Allegre, Brasilia, Rio De Janiero, Pasadena, and Fukushima. In the fall, Music From Japan organized a collaboration with the New York City Opera in the presentation of the American premiere of the Japanese opera Kinkakuji (The Temple of the Golden Pavilion). With music by Toshiro Mayuzumi and a libretto by Claus Henneberg, the opera is based on the award winning novel The Temple of the Golden Pavilion by Yukio Mishima. 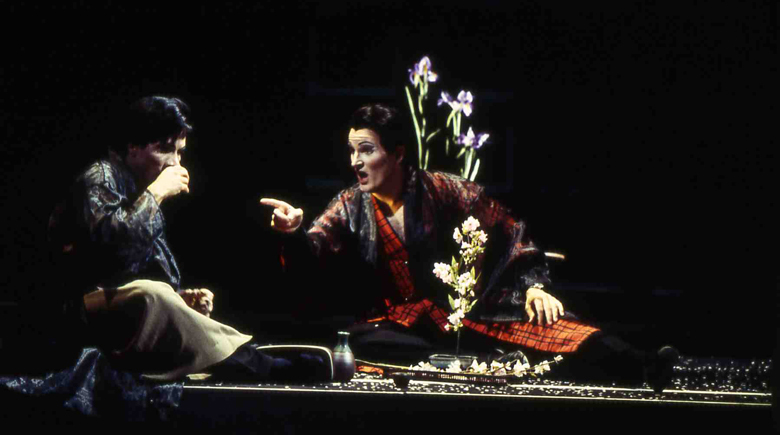 Written originally in German, Kinkakuji was translated by Christopher Keene, at the time the General Director of the New York City Opera. This presentation had the distinction of being the first fully-staged grand opera by a Japanese composer performed by a major American company. On August 16th, in order to give New Yorkers some background information, a symposium was held called Yukio Mishima and the World of Kinkakuji. The performance was held on October 19thand 24th, and November 3rd and 8th 1995 at the New York State Theater, Lincoln Center.